We are excited to announce the launch of Creative Diagnostics’ newly designed website-www.creative-diagnostics.com ! Our goal with this new designed website is create a user-friendly browsing experience for our trusted and valued customers and business partners. We hope you enjoy our new uncluttered design that is easy to navigate, and more user-friendly. Our current and prospective clients will find useful information about our products and services on the homepage of our website. 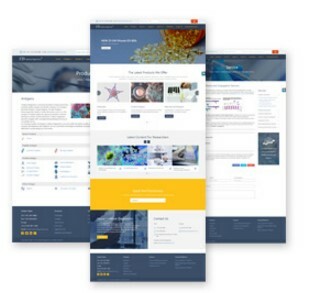 There are direct links to our antibodies, antigens, ELISA kits, rapid test kits and critical hybridoma development reagents are available on the homepage, as well as technical information such as antibody pairing and application data. There are promotions, new products, technical brochures, special offers and resources in this section. If you are lucky, you may get coupons in the promotional section. We will regularly launch some new products in the new products section. We have new lab start-up savings program, scholarship program, publication program and review program that deliver savings and academic support across the world. Advance your research with access to the resource section with guides, protocols, signaling pathway articles and other hot topics for every research area, with more added every month. Learn more resources you may be interested in. There are many new products and support waiting for you to discover. Learn more. The site contains integrated social media buttons for Blog, Facebook, Twitter, Linkedin and Google+ to foster improved communication with the clients. We will be constantly updating our content with helpful information, articles, blogs, company announcements and new products in the News section.